Sept. 18 (Bloomberg) -- China, the largest soybean buyer, will post weakening demand for imports of the oilseed in coming weeks after appetite dropped in the last seven days, the state- backed China National Grain & Oils Information Center said. An index measuring demand for agricultural products ranked soybeans 51.9 on a scale of 0 to 100 this week, compared with 53.1 last week and 44.4 the same period last year, the center said today in an e-mailed report. A reading below 50 indicates a bearish outlook. Sept. 18 (Bloomberg) -- Crude oil in New York was poised for a second week of gains as reports on jobless claims, housing and manufacturing added to evidence the economy is recovering in the U.S., the world’s biggest energy consumer. Oil rose this week after Federal Reserve Chairman Ben S. Bernanke said the worst recession in seven decades has probably ended. U.S. crude stockpiles dropped to the lowest since January, a Sept. 16 Energy Department report showed. Crude oil for October delivery was at $72.29 a barrel, down 18 cents, in electronic trading on the New York Mercantile Exchange at 9:04 a.m. Sydney time. Oil is up 4.3 percent this week, and 62 percent this year. Housing starts in the U.S. rose to the highest level in nine months, the Commerce Department said yesterday, led by construction of multifamily dwellings. The Federal Reserve Bank of Philadelphia said its general economic index jumped more than forecast to 14.1 in September from 4.2 in August. The number of Americans filing first-time claims for jobless benefits fell unexpectedly last week, a sign the labor market is deteriorating at a slower pace. Applications dropped by 12,000 to 545,000 in the week ended Sept. 12, from a revised 557,000 the week before, Labor Department data showed yesterday. Stockpiles of crude oil in the U.S. dropped 4.73 million barrels to 332.8 million last week, the Energy Department report showed. The Standard & Poor’s 500 Index lost 0.3 percent in New York after closing at the highest level since Oct. 3 on Sept. 16. The Dow Jones Industrial Average slipped 7.79 points, or less than 0.1 percent. Brent crude oil for November settlement fell 12 cents to end the session at $71.55 a barrel on the London-based ICE Futures Europe exchange yesterday. Sept. 18 (Bloomberg) -- The dollar may fall, capping a second-straight weekly decline against the euro, as signs the global economic recovery is accelerating spur investors to sell the greenback and buy higher-yielding assets. The Dollar Index, which tracks the U.S. currency against six major trading partners, yesterday dropped to the weakest level in almost a year before reports next week forecast to show a gauge of leading indicators for the U.S. economy improved in August and German business confidence rose for a sixth month in September. New Zealand’s dollar headed for a 10th consecutive week of advances, matching the record winning posted in May 1999. The dollar traded at $1.4732 per euro at 8:43 a.m. in Tokyo from $1.4741 yesterday in New York. It reached $1.4767 yesterday, the weakest level since Sept. 25, 2008. The yen was at 91.17 per dollar from 91.08 yesterday. Japan’s currency fetched 134.31 per euro from 134.28. Australia’s currency traded at 87.06 U.S. cents from 87.28 cents in New York yesterday, when it touched 87.75, the highest since Aug. 22, 2008. New Zealand’s dollar bought 70.98 U.S. cents from 71.07 in New York yesterday, when it reached 71.58, also the most since Aug. 22, 2008. The cost of three-month loans in dollars between banks held yesterday at a record low of 0.292 percent, according to the British Bankers’ Association. The London interbank offered rate, or Libor, is lower than that of the yen and Swiss franc, making the dollar the cheapest funding currency. The Dollar Index sank yesterday as low as 76.010, the weakest level since Sept. 22, 2008. The gauge dropped about 15 percent from its 2009 high of 89.624 reached in March as investors sought refuge from the global financial crisis. The Conference Board’s leading indicators, which show the outlook for the next three to six months, probably rose 0.7 percent in August, climbing for a fifth month, according to a Bloomberg News survey of economists before the New York-based research group releases the data on Sept 21. The Munich-based Ifo institute’s business climate index, based on a survey of 7,000 executives, increased to 92.0 in September from 90.5 in the previous month, according to a separate Bloomberg News survey before the institution releases the data on Sept. 24. The Bloomberg Professional Global Confidence Index rose to 58.54 this month from 58.12 in August. The index exceeded 50 for a second month, meaning optimists outnumbered pessimists. The euro’s half-year gain versus the dollar may stall, according to a technical indicator. The 14-day relative strength index on the euro-dollar exchange rate climbed to 74 yesterday, the highest level since March 19. A reading of 70 indicates a rally is approaching an extreme and a reversal may be imminent. “The dollar has gone down hard enough, fast enough where there is going to be a pullback,” said Lane Newman, director of currency trading at ING Financial Markets LLC in New York. CPO 3rd month Dec futures contract traded marginally RM1 higher as compare to previous trading sessions to close at RM2182 with a total of 6,661 lots traded in the market. CPO price were traded sideways during trading session despite crude oil and soybean oil overnight strong closing. Technically, CPO price were traded sideways during trading session while manage to test 80-day and 100 – day moving resistance levels at RM2190 regions 3 time before CPO stop for trading. Based on our technical view, our opinion suggests CPO price would pull back slightly during trading sessions where support seen at RM2140 and RM2122 regions. However, traders were advice to hold long position in the coming trading sessions provided support levels were not violated. 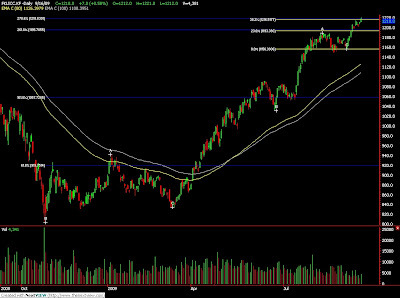 Resistance levels were seen at RM2190 and RM2205 regions. FKLI Sep Futures contract traded marginally 2 points lower to close at 1216 levels as compare to previous trading session to with a total of 4,020 lots traded in the market. FKLI traded lower during trading session after opened higher during trading session despite most of the regional indices were traded highest upon closing of trading sessions. Technically, FKLI fail to hold above resistance levels at 1221 regions after manage to complete 38.1% Fibonacci projection levels at 1224.5 regions in the hourly chart. Based on our technical knowledge, our opinion suggests FKLI still riding on a bull rally provided support levels at 1202 and 1190 must not be violated in the coming trading sessions. 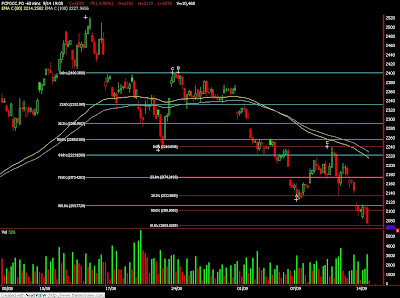 Traders were advice to hold long position while be cautious around resistance levels at 1224.5 and 5 and 1231.5 regions. Sept. 17 (Bloomberg) -- Oil traded near $72 a barrel in New York after the U.S. Energy Department reported that stockpiles of the fuel in the biggest energy consuming nation dropped to the lowest level since January. Crude inventories fell 4.73 million barrels, the weekly report showed yesterday, more than the 2.5 million-barrel decline forecast in a Bloomberg News analyst survey. Prices also gained as the dollar declined to the weakest level in almost a year and as U.S. equities advanced. Crude oil for October delivery was at $72.41 a barrel, down 10 cents in electronic trading on the New York Mercantile Exchange at 10:17 a.m. in Sydney. Yesterday, the contract rose $1.58, or 2.2 percent, to $72.51. Futures are up 62 percent since the start of the year. The dollar traded at $1.4706 per euro at 7:51 a.m. in Tokyo from $1.4709 yesterday in New York where it reached $1.4737, the weakest level since Sept. 25, 2008. A lower dollar increases the appeal of commodities as an alternative investment. U.S. crude oil stockpiles fell to 332.8 million barrels, the Energy Department said. Supplies of distillate fuel climbed 2.24 million barrels to 167.8 million, the highest since January 1983. Gasoline inventories rose 547,000 barrels to 207.7 million last week, the department said. Imports decreased 2.1 percent to an average 8.9 million barrels a day. Refineries operated at 86.9 percent of capacity in the week ended Sept. 11, down 0.3 percentage point from the previous week, according to the department. Japan’s and Australia’s stock futures rose amid speculation the global economy has returned to growth. Futures on Japan’s Nikkei 225 Stock Average expiring in September closed at 10,310 in Chicago yesterday, 1 percent higher than 10,210 in Osaka. Australia’s S&P/ASX 200 Index futures contract due in September rose 1.1 percent in Sydney today. The Standard & Poor’s 500 Index gained 1.5 percent in New York yesterday and the Dow Jones Industrial Average added 108.3 points, or 1.1 percent. Brent crude oil for November settlement on the London-based ICE Futures Europe exchange rose $1.81, or 2.6 percent, to $71.67 a barrel yesterday. Sept. 17 (Bloomberg) -- The dollar traded near a one-year low versus the euro on speculation the global recession is easing, curbing demand for safe-haven currencies. The Dollar Index was near the weakest in 12 months as Asian stocks extended a global rally and before reports forecast to show U.S. housing starts rose and manufacturing improved. The yen fell against all 16 most-active currencies after data showed Japanese purchases of overseas bonds reached a four-year high, signaling increased demand for higher-yielding assets. The dollar traded at $1.4715 per euro at 9:18 a.m. in Tokyo from $1.4709 yesterday in New York where it reached $1.4737, the weakest level since Sept. 25, 2008. The yen was at 91.16 per dollar from 90.93 yesterday, when it hit 90.13, the strongest level since Feb. 12. Japan’s currency fetched 134.21 per euro from 133.78. Australia’s currency traded at 87.37 U.S. cents from 87.35 cents yesterday, when it touched 87.50 cents, the most since Aug. 22, 2008. New Zealand’s dollar was at 71.37 U.S. cents from 71.41 cents in New York, where it reached 71.53, also the strongest since Aug. 22, 2008. The Nikkei 225 Stock Average rose 1 percent and the MSCI Asia Pacific Index of regional shares gained 0.8 percent. The Philadelphia Federal Reserve Bank will report today that its index of the region’s manufacturing activity advanced this month to the highest level since 2007, according to the median forecast of 55 economists in a Bloomberg News survey. The index is expected to increase to 8 from 4.2 in August, with a positive reading signaling expansion. Adding to signs that the recession is abating, U.S. builders broke ground on 598,000 new homes last month at an annual rate from 581,000 in the previous month, according to a separate Bloomberg News survey before the Commerce Department releases the data today. The Bloomberg Professional Global Confidence Index rose to 58.54 this month from 58.12 in August. The index exceeded 50 for a second month, which means optimists outnumbered pessimists. Measures of confidence in France and Germany surged after their economies unexpectedly returned to growth last quarter. The Dollar Index, which tracks the U.S. currency against the euro, yen, pound, Canadian dollar, Swiss franc and Swedish krona, fell as much as 0.5 percent to 76.151 yesterday, the lowest level since Sept. 23, 2008. The gauge has fallen 15 percent from its 2009 high of 89.624 reached in March. It was little changed at 76.312 today. The broad gauge for the dollar declined after the London interbank offered rate, or Libor, for three-month dollar loans fell to a record low of 0.292 percent yesterday. It was as high as 4.82 percent in October 2008, following the collapse of Lehman Brothers Holdings Inc. the month before. The yen fell as Japanese investors bought 1.66 trillion yen ($18.2 billion) in overseas bonds and notes in the week ended Sept. 12, the most since June 2005, the Ministry of Finance said today. FKLI Sep Futures contract traded 7 points higher to close at 1218 levels as compare to previous trading session to with a total of 4,381 lots traded in the market. FKLI consolidate upwards rally in the morning trading session as regions indices were traded firm during trading session especially Hang Seng index that manage to surge 400 points upon closing. Technically, FKLI seems slow down after reach 278.6% Fibonacci projection around 1220 regions together with 38.1% Fibonacci projection at 1217 regions. Based on our technical view, our opinion suggests FKLI would only surge high provided buying interest would overcome resistance levels at 1221 and 1235. Traders were advice to hold long position in the coming trading session provided support levels at 1197 and 1181.5 were not violated trading session. CPO 3rd month Dec futures contract rose RM91 higher as compare to previous trading sessions to close at RM2181 with a total of 13,761 lots traded in the market. CPO price seems trading strong during trading hours as overnight crude oil and soybean oil traded firm despite were traded weak during electronic trading sessions. Technically, CPO price surge upwards during trading session and manage to rest around 78.6% Fibonacci retrace levels at RM2180 regions. Based on our technical view, our opinion suggests CPO price would only traded high provided buying interest must surpass selling pressure above resistance levels at RM2180 and RM2205 regions. Traders were advice to hold long position around the support levels at RM2070 and RM2044 regions if CPO price fails to penetrate current resistance levels during trading sessions. Sept. 15 (Bloomberg) -- The Organization of Petroleum Exporting Countries raised its global oil demand forecasts for this year and 2010 on expectations the world economy will return to growth. OPEC, responsible for about 40 percent of worldwide oil supply, boosted its 2010 outlook by 150,000 barrels a day and 2009 by 140,000 barrels a day. The group now predicts that consumption will contract 1.8 percent this year to average 84.05 million barrels a day, and then expand 0.6 percent in 2010 to 84.56 million a day. OPEC, which kept production quotas unchanged last week to prevent higher prices damaging the recovery, raised demand projections for its own crude next year by 80,000 barrels a day. That still represents a decline of 500,000 barrels a day in the world’s “call-on-OPEC” to 28.1 million a day as producers outside the group pump more. The International Energy Agency upgraded its own 2010 consumption outlook three times as much as OPEC in a report on Sept. 10. The Paris-based IEA, adviser on energy policy to 28 nations, ramped up its 2010 forecast 450,000 barrels a day to an average of 85.7 million a day. The 11 OPEC members bound by output quotas, which exclude Iraq, increased supplies to 26.334 million barrels a day last month, according to the report. That weakens their compliance rate with the record output curbs announced last year to 65 percent. Crude oil futures last traded in New York at $68.91 a barrel, having gained 53 percent this year as a result of the economic rebound and OPEC’s implementation of its biggest-ever production cut. Sept. 16 (Bloomberg) -- Oil fell in New York after an industry report showed an increase in distillate and crude stockpiles in the U.S., the world’s biggest energy consumer. Oil declined after the American Petroleum Institute reported distillate fuel inventories, including diesel and heating oil, climbed 5.2 million barrels while crude supplies rose 631,000 barrels. A U.S. Energy Department report today may show crude stockpiles declined and distillates increased. Crude oil for October delivery fell as much as 79 cents, or 1.11 percent, to $70.14 a barrel in electronic trading on the New York Mercantile Exchange. It was at $70.34 a barrel at 8:51 a.m. Singapore time. Yesterday, the contract rose $2.07 to settle at $70.93, the biggest increase since Sept. 8. Prices are up 58 percent this year. The price gained 3 percent yesterday as Federal Reserve Chairman Ben S. Bernanke said the recession has probably ended, spurring expectations of an increase in fuel demand. An Energy Department report today is forecast to show that U.S. crude-oil supplies fell 2.5 million barrels from 337.5 million in the week ended Sept. 11, according to the median of 15 estimates by analysts surveyed by Bloomberg News. “The pre-emptive nature of the market might be starting to run its course, and we’re waiting for the fundamentals to really justify a fresh push higher,” Hassall said. Distillate fuel supplies surged to 170.3 million barrels last week, the API said. That’s the highest level since January 1983. The Department of Energy report is expected to show those inventories climbed 1.25 million barrels from 165.6 million the prior week, according to the survey. Gasoline stockpiles increased 1.35 million barrels to 208.8 million last week, according to the API. The Energy Department report may show that inventories rose 700,000 barrels from 207.2 million the week before, the Bloomberg survey showed. The Energy Department is scheduled to release its Weekly Petroleum Status Report at 10:30 a.m. in Washington today. Gasoline consumption was at an eight-month low for the second straight week as the U.S. Labor Day holiday failed to ignite demand before the end of the summer driving season, according to a MasterCard Inc. report. Motorists bought an average 8.97 million barrels of gasoline a day in the week ended Sept. 11, MasterCard, the second-biggest credit-card company, said in its SpendingPulse report yesterday. That’s little changed from the prior week, when demand was the weakest since Jan. 9, and the fourth time this year that demand fell short of 9 million barrels. Brent crude oil for November settlement fell as much as 85 cents, or 1.2 percent, to $69.01 a barrel on the London-based ICE Futures Europe exchange. The contract yesterday climbed $1.49, or 2.2 percent, to end the session at $69.86 a barrel. The October contract expired yesterday at $67.35 a barrel, down 9 cents. The Organization of Petroleum Exporting Countries raised its global oil demand forecasts for this year and 2010 on expectations the world economy will return to growth. Nigeria’s main rebel group extended its cease-fire by 30 days and warned that its campaign targeting oil and gas installations will continue if the government doesn’t engage in meaningful talks. “The government should use this extension of time to do the right thing instead of pretending to talk peace, while arming the military for a war it cannot win,” Jomo Gbomo, a spokesman for the Movement for the Emancipation of the Niger Delta, said in an e-mailed statement. Sept. 15 (Bloomberg) -- Gold rose, closing above $1,000 an ounce for the third straight session, as commodities climbed on demand for a hedge against inflation. Silver also gained. Federal Reserve Chairman Ben S. Bernanke said the worst U.S. recession since the 1930s has probably ended, while warning that growth may not be strong enough to reduce unemployment quickly. The Fed has kept its benchmark lending rate as low as zero since December. It authorized $1.45 trillion in purchases of mortgage-backed securities and other housing debt this year. Gold futures for December delivery gained $5.20, or 0.5 percent, to $1,006.30 an ounce on the Comex division of the New York Mercantile Exchange. On Sept. 11, the metal reached a record closing price of $1,006.40. The price for immediate delivery gained $6.63, or 0.7 percent, to $1,006.93 at 2:54 p.m. New York time. Eighteen of 19 raw materials in the Reuters/Jefferies CRB Index rose today, led by a record surge in corn. “The debate on gold’s price prospects remains alive and well among both fundamentals-followers and technicians poring over charts,” Jon Nadler, a Kitco Inc. senior analyst in Montreal, said in a note. The dollar fell against a basket of six major currencies, extending a slide to the lowest in 11 months. Gold futures have rallied 28 percent since the demise of Lehman Brothers Holdings Inc. a year ago as investors bought precious metals to protect their wealth amid the first global recession since World War II. “Charts indicate that if the $1,050 level is not attained during the current ‘break-out’ or if a double or triple top is confirmed under that same level, then gold could signal a reversal such as the ones that occur on average about every six years,” Nadler said. Futures reached an 18-month high of $1,013.70 on Sept. 11. Gold may climb to as high as $1,100 in the next six months, researcher GFMS Ltd. said yesterday. Sales at U.S. retailers in August surged 2.7 percent, the most in three years, from July, government data showed today. Hedge-fund managers and other large speculators increased their bets on rising New York gold futures to a record in the week ended Sept. 8, the U.S. Commodity Futures Trading Commission said last week. Net-long positions jumped 22 percent to a 224,676 contracts, the biggest increase this year. Silver futures for December delivery in New York rose 37.7 cents, or 2.3 percent, to $17 an ounce. The price has gained 51 percent this year. Platinum futures for October delivery was little changed at $1,320.30 an ounce on the Nymex. Palladium futures for December delivery gained 0.2 percent to $296.25 an ounce. Sept. 16 (Bloomberg) -- The dollar traded near the weakest level this year against the euro before a report forecast to show U.S. manufacturers boosted output, reducing demand for the relative safety of the greenback. The Australian and New Zealand currencies were near this year’s highs against the dollar as Asian stocks extended a global equity rally after the biggest gain in U.S. retail sales for three years encouraged investors to buy riskier assets. Federal Reserve Chairman Ben S. Bernanke said the worst U.S. recession since the 1930s has probably ended and billionaire investor Warren Buffett said his company is buying equities. The dollar dropped to $1.4679 per euro as of 9:28 a.m. in Tokyo from $1.4658 yesterday in New York, when it reached $1.4686, the highest since Dec. 18. Japan’s currency traded at 133.35 per euro from 133.47 yesterday in New York. It was at 90.83 per dollar from 91.05 yen. Australia’s currency bought 86.51 U.S. cents, close to its strongest since August 2008, from 86.34 cents yesterday in New York. New Zealand’s dollar fetched 70.63 U.S. cents from 70.50 cents, near its highest since August 2008. Benchmark interest rates of 3 percent in Australia and 2.5 percent in New Zealand attract investors who invest in the countries’ assets using loans from nations with lower costs such as the 0.1 percent benchmark in Japan and the U.S. rate which is as low as zero. The risk in such carry trades is that exchange- rate changes can erase profits. The Dollar Index traded near the lowest in one year after a Commerce Department report showed U.S. retail sales increased 2.7 percent last month after a revised 0.2 percent drop in July, adding to signs the recession is ending. The Federal Reserve Board’s measure of U.S. production, due for release today, probably rose 0.6 percent, the most since October, according to a Bloomberg News survey of economists. The report may also show the proportion of plant capacity in use climbed to 69 percent, the highest in five months. The Nikkei 225 Stock Averaged gained 0.8 percent and the MSCI Asia Pacific Index of regional shares advanced 1.1 percent. Berkshire Hathaway Inc. is “buying stocks right as we speak,” Buffett told a conference in California, adding that he’s getting a “lot for my money” in equities. The Dollar Index, which tracks the greenback against the euro, yen, pound, Canadian dollar, Swiss franc and Swedish krona, fell to 76.411 from 76.520 yesterday. It earlier hit 76.406, the lowest level since September 2008. The yen rose for the first time in three days against the dollar on speculation foreign investors may shift their focus to Japanese assets from the rest of Asia. Foreign investors bought 180.8 billion yen ($2 billion) in Japanese bonds and 132.4 billion yen in stocks, and sold 26.3 billion yen in short-term securities during the week ended Sept. 5, according to figures based on reports from designated major investors released by the Ministry of Finance in Tokyo. Sept. 15 (Bloomberg) -- Crude oil traded little changed near $69 a barrel on speculation U.S. refiners may cut operating rates to avoid adding to historically high fuel stockpiles. U.S. crude oil inventories probably fell last week as refineries bought fewer cargoes before idling plants for seasonal maintenance, according to a Bloomberg News survey ahead of an Energy Department report tomorrow. The country’s supplies of distillate fuel are expected to have risen for a fourth week from their highest levels since 1983. Crude oil for October delivery was at $69.03 a barrel in electronic trading on the New York Mercantile Exchange, up 17 cents at 7:26 a.m. in Singapore. Yesterday, the contract fell a second day to $68.86, the lowest settlement since Sept. 4. Futures have gained 55 percent this year. Big consumer nations including the U.S. and Japan have been accumulating fuel stockpiles as the global recession crimped demand. Refiners are cutting back output to support profits as consumption enters a seasonal lull period. “The driving season is over, heating oil demand has yet to pick up and refineries are going into turnarounds, which means a lot of demand for crude oil will be offline,” said Stephen Schork, president of consultant Schork Group Inc. in Villanova, Pennsylvania. Commercially held U.S. crude oil inventories likely declined 2.5 million barrels from 337.5 million in the week to Sept. 11, according to the median of 11 estimates from analysts. Stockpiles of distillate, which includes heating oil and diesel, may have increased 1.5 million barrels from 165.6 million in the prior week, while gasoline inventories probably climbed 700,000 barrels from 207.2 million, the survey showed. Refineries operated at 86.7 percent of capacity last week, a drop of 0.5 percentage point, according to the median of survey responses. The Energy Department is scheduled to release its Weekly Petroleum Status Report tomorrow. The industry-funded American Petroleum Institute will put out its own data at 5:30 p.m. in Washington today. The main militant group in Nigeria said it will end its 60- day cease-fire today. The Movement for the Emancipation of the Niger Delta, or MEND, which seeks more local control of the delta’s oil wealth, declared a unilateral cease-fire July 15 after the government freed its leader, Henry Okah, who was on trial for treason. MEND rejected a government amnesty program, saying it failed to deal with its political demands. Armed attacks targeting the oil industry have cut more than 20 percent of Nigeria’s oil exports since 2006 and deterred new investments. The country vies with Angola as Africa’s top oil producer and is the fifth-largest source of U.S. oil imports. Brent crude oil for October settlement ended yesterday’s trading at $67.44 a barrel on the London-based ICE Futures Europe exchange, down for a second day. Sept. 14 (Bloomberg) -- Gold fell from an 18-month high on speculation that investors may begin selling out of long positions, which climbed to a record last week, and the dollar strengthened, halting a six-session slide. Silver also declined. Some investors buy metals, including gold, as an alternative investment. Hedge-fund managers and other large speculators increased their net-long position in New York gold futures by 22 percent to 224,676 contracts in the week ended Sept. 8, U.S. Commodity Futures Trading Commission data show. The dollar gained as much as 0.6 percent against a basket of six major currencies. “All the talk is that Comex gold net longs are extremely high and longs should start liquidating,” Miguel Perez- Santalla, a Heraeus Precious Metals Management sales vice president in New York, said by e-mail. Gold futures for December delivery slid $5.30, or 0.5 percent, to $1,001.10 an ounce on the New York Mercantile Exchange’s Comex division. The metal added 1 percent last week, the fourth consecutive gain. “We are concerned by very large speculative long positions held on Comex,” John Reade, UBS AG’s head metals strategist in London, said today in a note. “We recommend that nimble investors take profit in gold and silver at current levels and look to re-enter the market” at lower prices. Speculative long positions, or bets on rising prices, have climbed for three straight weeks on the Comex, the Washington- based commission said on Sept. 11. Citing a “bearish” outlook for the dollar, David Wilson and Stephanie Aymes, Societe Generale analysts in London, said they “continue to be bullish on gold on positive fund flows,” in a report today. They said they are “modestly bullish on silver,” also because of fund flows. Holdings in the SPDR Gold Trust, the biggest exchange- traded fund backed by bullion, were unchanged at 1,077.63 metric tons as of Sept. 11, the company’s Web site shows. ETF Securities Ltd.’s Web site shows gold held by its funds gained 0.7 percent to a record 8.217 million ounces on Sept. 11. Gold for immediate delivery fell $6.03, or 0.6 percent, to $999.17 an ounce at 6:40 p.m. in London. Spot prices, which reached a record $1,032.70 an ounce in March 2008, may climb to $1,050 this year as a weaker dollar boosts demand, Bank of America Securities-Merrill Lynch said in a report dated Sept. 11. “We expect the dollar to play a heavy hand in the metal’s direction, with gold vulnerable to sharp correction should safe- haven interest return to the greenback,” James Moore, an analyst at TheBullionDesk.com in London, said in a report. The U.S. Dollar Index, the six-currency gauge of the greenback’s strength, slid to an 11-month low on Sept. 11. Gold futures, which reached $1,013.70 an ounce on Sept. 11, the highest price since March 2008 in New York, typically decline when the dollar strengthens. Crude oil fell for a second session in New York as U.S. fuel stockpiles grew. Some investors use oil prices as an inflation guide, and buy gold as a hedge against higher prices. Silver futures for December delivery declined 7.7 cents, or 0.5 percent, to $16.623 an ounce in New York. The most-active contract reached a 13-month high of $17.015 on Sept. 11. Platinum futures for October delivery declined $1 to $1,319.70 an ounce. The most-active contract reached $1,328 on Sept. 11, the highest price in a year. Palladium for December delivery gained $1.25, or 0.4 percent, to $295.75 an ounce in New York. ETF Securities’ silver holdings rose 1 percent to a record 20.728 million ounces on Sept. 11, while palladium assets climbed 1.4 percent to an all-time high 489,942 ounces. Sept. 15 (Bloomberg) -- The dollar traded near the weakest level against the euro this year as record low borrowing costs encouraged investors to sell the greenback and buy higher- yielding assets outside the U.S. The 16-nation currency may rise for a second-day against the dollar before a report forecast to show German investor confidence improved this month, signaling the recession in the region’s biggest economy is easing. Federal Reserve Bank of San Francisco President Janet Yellen said prospects for a “tepid” recovery require that policy makers guard more against inflation becoming too low rather than too high. The dollar traded at $1.4629 per euro at 7:57 a.m. in Tokyo from $1.4618 yesterday in New York where it reached $1.4653, the weakest level since Dec. 18. The yen was at 90.88 against the dollar from 90.94 yesterday when it touched 90.21, the strongest level since Feb. 12. The yen fetched 132.96 per euro from 132.94. The cost of three-month loans in dollars between banks fell yesterday to a record low of 0.295 percent, according to the British Bankers’ Association. The London interbank offered rate, or Libor, slid below that of the Swiss franc on Sept. 8 for the first time since November. The Dollar Index traded near the lowest level in almost one year after Yellen said there’s a “fear,” which is “real, growing and disruptive,” that the Fed will be unable to withdraw its $1 trillion expansion of credit. “We face an economy with substantial slack, prospects for only moderate growth, and low and declining inflation,” Yellen said yesterday in a speech in San Francisco. Until the time comes to raise interest rates, “we need to defend our price stability goal on the low side and promote full employment,” she said. The Dollar Index, which IntercontinentalExchange Inc. uses to track the greenback against the euro, yen, pound, Canadian dollar, Swiss franc and Swedish krona, was little changed at 76.653 yesterday. It dropped to 76.457 on Sept. 11, the lowest level since Sept. 25, 2008. The U.S. target lending rate of zero to 0.25 percent compares with 8.75 percent in Brazil and 1.25 percent in Norway. The euro rose against 12 out of the 16 most-active currencies as a Bloomberg News survey of economists showed that the ZEW Center for European Economic Research’s index of German investor confidence probably jumped to 60 this month, from 56.1 in August. The institution will release the data today. Adding to signs the global gloom is easing, U.S. retail sales likely advanced 1.9 percent in August, following a 0.1 percent decline in the prior month, according to a separate Bloomberg News survey. CPO 3rd month Nov futures contract plunge RM75 lower as compare to previous trading sessions to close at RM2070 with a total of 10,468 lots traded in the market. CPO price seems plunge lower during trading session as crude oil and soybean oil were traded weak during trading sessions. Technically, CPO price plunge lower during last trading hours after long consolidation within range from 2090 to 2115 regions. Based on our technical view, our opinion suggests CPO price seems temporary supported above 61.8% Fibonacci projection levels at RM2070 regions while next support levels seen at RM2044 regions. 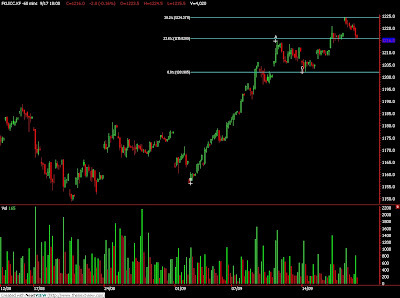 Its critical support levels for mid term bull rally to remain intact in the market. Traders were advice to only hold long position provided support levels were not violated at any time during trading session while be alert around resistance levels at RM2115 and RM2177 region. FKLI Sep Futures contract fall 5.5 points lower to close at 1205.5 levels as compare to previous trading session to with a total of 3,854 lots traded in the market. FKLI was mainly traded sideways during trading session after opened lower in the 1st trading session as regional indices lead by Nikkei Indices plunge along with Dow Jones futures electronic trading. 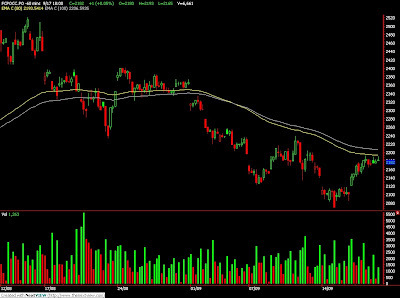 Technically, FKLI were traded sideways throughout entire trading session ranging from 1205 to 1208 regions. It’s a tight trading days for the traders. Based on our technical view, our opinion suggests strong buying interest around 1197 to 1200 regions while resistance levels at 1208 and 1215 seen as great selling pressure. 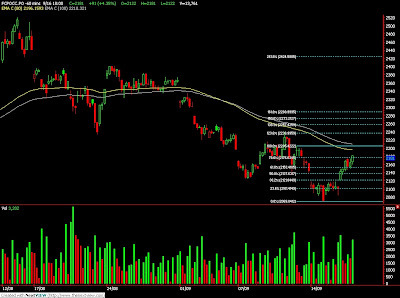 Traders were advice to trade cautiously as FKLI might be trading within range in the coming trading session. 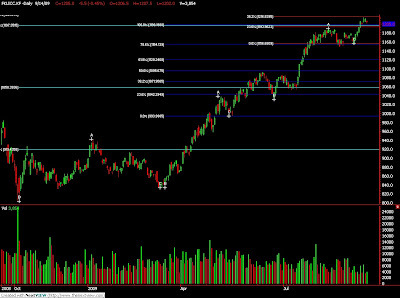 Overall, FKLI still haven’t any signal of reversal provided support levels were violated. Sept. 14 (Bloomberg) -- Gold declined as gains by the dollar and falling oil prices sapped demand for the precious metal as an alternative investment. Bullion, which typically moves inversely to the dollar, snapped a two-day advance as crude oil dropped to a one- week low and Asian stocks fell. The Dollar Index, a six- currency gauge of the U.S. currency’s value, rose 0.4 percent after six days of declines. Gold for immediate delivery fell 0.4 percent to $1,002.92 an ounce at 1:24 p.m. in Singapore. The metal reached $1,011.95 on Sept. 11, an 18-month high, and has gained 13 percent this year. The dollar index is down 5.4 percent this year. The MSCI Asia Pacific Index of regional shares lost 1.6 percent, ending two days of gains, as commodity prices fell and a stronger yen hurt Japanese exporters. Oil dropped as much as 1.8 percent on speculation crude’s rally to more than $72 a barrel last week outpaced the recovery in the global economy. UBS AG recommended investors sell gold and silver, citing a jump in speculative buying of the precious metals. Net speculative long positions in bullion were at a record 29.02 million ounces on the Comex division of the New York Mercantile Exchange as of Sept. 8, UBS said in a Sept. 12 report. That was 2.2 million more than the previous record in February, while net long positions in silver rose to 304 million ounces, the largest since July 2008, the report said. UBS said it held its one-month forecast for gold at $950 an ounce and expected the metal to trade higher in 2010. Gold holdings in the SPDR Gold Trust, the biggest exchange- traded fund backed by bullion, were unchanged at 1,077.63 metric tons as of Sept. 11, according to the company’s Web site. Among other precious metals for immediate delivery, silver fell 1.6 percent to $16.475 an ounce and platinum slumped 1.3 percent to $1,301.25 an ounce. Palladium fell 0.3 percent to $291.25. Sept. 14 (Bloomberg) -- Crude oil fell for a second day on speculation its rally to $75 a barrel last month outpaced the rate of recovery in the global economy. A report tomorrow in the U.S., the world’s largest oil consumer, may show retail spending, excluding gasoline and autos, was barely changed in August, according to a survey of economists. Oil dropped the most in two weeks on Sept. 11 after failing for a fourth day to breach $73 and as U.S. equities declined for the first time in six days. Crude oil for October delivery dropped as much as 75 cents, or 1.1 percent, to $68.54 a barrel in after-hours electronic trading on the New York Mercantile Exchange. It traded at $68.55 at 7:53 a.m. in Singapore. The contract fell 3.7 percent to $69.29 on Sept. 11, the biggest decline since Aug. 31. Prices slumped even as the dollar fell for a sixth day to its lowest in almost a year, making commodities priced in the currency more attractive. Oil futures have gained 54 percent this year as rising equity prices emboldened investors and the weaker dollar lured funds toward oils and metals. Prices are pre-empting the recovery in global demand and have been driven by investors buying oil to profit from the weaker dollar and improving sentiment, Hassall said. The weaker dollar will be “very supportive for the commodity space” and will likely offset any signs of a slower- than-expected improvement in demand or a mild winter in the northern hemisphere, he said. World oil demand usually peaks in the fourth and first quarters as refiners make heating fuel for the northern hemisphere winter. Daily consumption may climb to 84.7 million barrels in the three months ended Dec. 31 from 84.4 million now, the International Energy Agency forecast Sept. 10. U.S. oil inventories are 12 percent higher than a year ago, the Energy Department said in a weekly report on Sept. 10. Distillate stockpiles, including heating oil and diesel, hold 25 percent more than last year and are at their highest since 1983. Brent crude oil for October settlement fell 56 cents, or 0.8 percent, to $67.13 a barrel on the London-based ICE Futures Europe exchange. It dropped 3.1 percent to $67.69 on Sept. 11. Sept. 14 (Bloomberg) -- The dollar declined, reaching the weakest level in seven months against the yen, as falling funding costs for the U.S. currency prompted investors to sell it in favor of riskier assets. The Dollar Index touched 76.457 on Sept. 11, the lowest since Sept. 25, 2008, as dollar-denominated short-term interest rates dropped to the cheapest level against yen-based loans in 16 years. The yen rose against higher-yielding currencies including the Australian dollar amid speculation Japanese investors will repatriate earnings before the end of fiscal first half this month. The dollar fell to 90.22 yen as of 8:03 a.m. in Tokyo from 90.71 yen in New York on Sept. 11. It earlier sank to 90.21 yen, the lowest level since Feb. 12. The yen surged to 131.81 per euro from 132.17 in New York. The euro advanced to $1.4590 from $1.4571. The three-month London interbank offered rate, or Libor, for dollars dropped below that of the Swiss franc on Sept. 8, making the greenback the cheapest currency to fund purchases of higher-yielding assets. The dollar rate ended the week at a record low of 0.299 percent, compared with 0.359 for the yen and 0.307 for the franc. The spread between three-month Libor for yen and dollar loans was 7.25 basis points on Sept. 8, according to British Bankers’ Association data, the widest gap since March 1993. Futures traders increased bets that the yen will gain against the U.S. dollar, figures from the Washington-based Commodity Futures Trading Commission showed. The difference in the number of wagers by hedge funds and other large speculators on an advance in the yen compared with those on a drop -- so-called net longs -- was 40,799 on Sep. 8, compared with net longs of 32,365 a week earlier.